New rewritable CDs in recycled cases means you get the best of both worlds. When you choose GreenDisk CD-RW almost all of what you buy is recycled. Only the disc is new. As CDs become more popular we recycle more of them. This gives us a lot of high quality plastic. To bring you our premium CD-RW we start by making the jewel case from recycled plastic. Next, we make our packaging using recycled paper and then we insert a brand new disc. 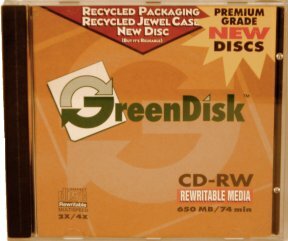 Presto....you get GreenDisk CD-RWs. Made from the best stuff everyone else already made. You can save your CDs while you help save the planet. All in all a pretty good deal.